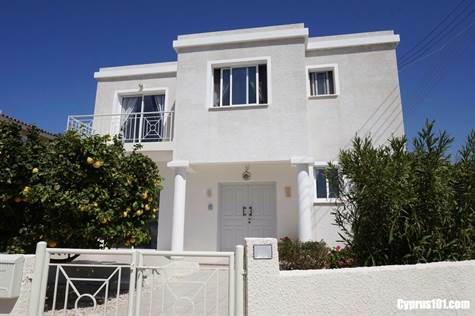 Kissonerga, Paphos – This well presented 3 bedroom detached villa is situated in a quiet residential area within easy walking distance to the traditional village of Kissonerga. The village has many local amenities including bars, restaurants, bakery, pharmacy and supermarket. The property is spacious throughout and features a large open plan living room with attractive archway separating the comfortable lounge from the dining area and kitchen.The kitchen is well equipped with built-in oven, electric hob and extractor fan, fridge freezer, and dishwasher. The washing machine is housed in the separate utility room to the rear of the kitchen where there is also useful storage space.A guest cloakroom and understairs cupboard is situated at the base of the staircase leading up to three good size double bedrooms, all with fitted wardrobes and en-suite facilities.The master bedroom has a private balcony with mountain views, and bedroom two and three share a second balcony with pleasant views of the surrounding neighbourhood. The outside space has been designed to take full advantage of the wonderful outdoor life. Off the kitchen is a large terrace with pergola and outdoor kitchen including built-in barbacue and oven. Stepping down to the pool terrace there is a fitted bar with fridge and plenty of space for relaxing and sunbathing.The gardens are beautifully landscaped with a good selection of colourful shrubs and trees. To the rear of the gated driveway are storage sheds well screened from the main leisure areas. The property is maintained to a high standard by the current owners and includes white goods, curtains and light fittings. It’s ideal as both a permanent residence and/or holiday home and has full title deeds. Furniture is negotiable if required.